Commissioning your own painting is easier than you think, and the term ‘commissioning’ simply means that you contact an artist and ask them to create a painting specifically for you, whether that painting is a landscape, animal, portrait, or pet portrait e.t.c ..rather than buying a pre-existing painting that an artist has previously painted. If you have something in mind, but you can’t find the painting to match your idea. As a memory of a special place. As a memory or tribute to a loved one. As a memory or tribute to a beloved pet. For a leaving work colleague. Once someone has found an artist who’s style they like, they contact that artist with their idea for a painting. The artist and the client discuss the required subject, painting size, painting shape, composition, colours, cost… etc. Most artists will have a set price list for their most popular painting sizes and you can find my prices here. The artist gathers reference material, perhaps photos or sketches, or the client sends/emails their own photographs, sketches ..e.t.c to the artist to use and to work from. Once everything has been finalised, the artist usually asks for a deposit to secure the commission, and begins work on the clients painting. Sometimes, and as I do with my own clients, the artist will email through photographs at key stages throughout the painting process as the painting develops. Most artists welcome all feedback throughout these stages, the whole idea of emailing updates through is so that the client can see how their painting is developing so that they can advise on any changes or alterations they might like. It’s much easier to alter a painting at these early stages than at the end when the painting is complete. When the painting is finished and the client is happy with the final images sent through to them, or the client has visited the artist’s studio to view the final piece, they are presented with the finished painting. 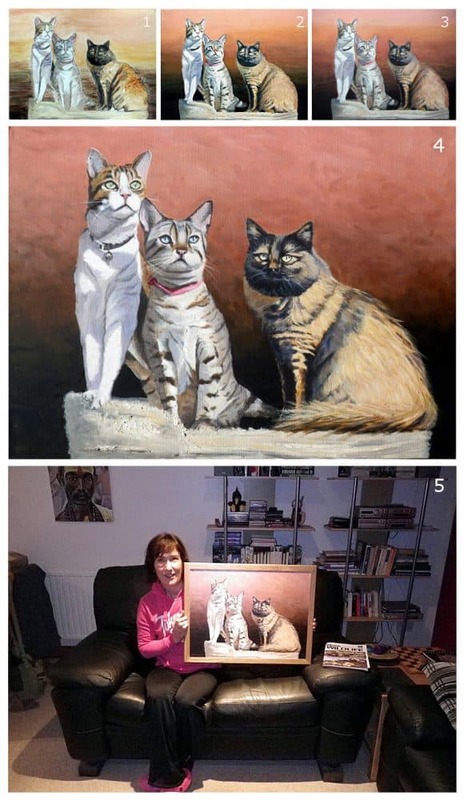 Happy client collecting her painting – See this painting in my pet portrait gallery here. Usually, an artist will ask for a deposit before beginning work on a painting, this is to guarantee the order and cover costs of booking a time slot and procurement of canvas and paints. In this internet age it is often the case that the commissioned artist does not live locally, in this situation an artist will email the client a large resolution image for final approval. If however it’s possible to travel or the client lives locally a live final viewing is always best. I invite all of my clients to visit my studio to see their paintings before final approval, although the vast majority are very happy with final emailed image and a studio visit is not required. Not all artists offer a framing service, but most use a professional framer for their own work and can therefore arrange for a commissioned painting to be framed ( there may be an extra charge for delivery of framed paintings though, be sure to ask ). When all parties are happy final payment is made, and the client is then the owner of a unique personally hand painted work of art. Read some of my own testimonials from some of my happy clients.